Совместный релиз лейбла-партнёра GrimmDistribution (Беларусь) с The Ritual Productions (Нидерланды) и Black Metal Records (США): новый альбом "Tormento" итальянской industrial black metal группы Nocratai выходит 24 июля! / Co-release by our label-partner GrimmDistribution (Belarus) with The Ritual Productions (Netherlands) and Black Metal Records (USA): new album "Tormento" of Italian industrial black metal band Nocratai is out on July 24th, 2018! «Tormento» - дебютный альбом итальянской industrial black metal группы Nocratai, записанный в 2011 году, включает в себя более 50 минут настоящего разрушительного безумия и параноидальной музыки. Звуковое путешествие к неизвестному, исследующее самые тёмные углы человеческого разума. Industrial Black Metal с жёсткими электронными вставками и сэмплами из фильмов, сильная антихристианская концепция, исполняемая в основном на итальянском языке. Для поклонников MYSTICUM, BLACKLODGE и старого ABORYM. Nocratai was born in 1999 by the sick mind of "4" to play and release sick industrial black metal chaos exclusively. For almost a decade the band existed as a solo project releasing many tapes and splits until 2008, when other 3 musicians joined to form a real band with a solid line up. In the same year Nocratai released the infamous "Camera Chiusa" EP, a sick manifesto of industrial black metal with drum machine and samples from another world. The band also started playing live for few selected live shows in 2008-2009. In 2011 the band recorded the debut album "Tormento", a clausrophobic opera of sonic torment that for various reasons remained on hold for almost a decade. 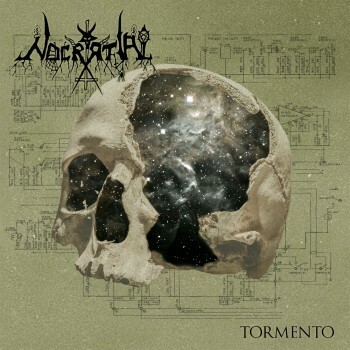 "Tormento" is the debut album of Italian industrial black metal band Nocratai, recorded in 2011 includes more than 50 minutes of pure destructive madness and paranoia made music. A sonic travel towards the unknown exploring the darkest corners of the human mind. Industrial Black Metal with harsh power electronic inserts, samples from movies and a strong antichristian concept sung mostly in Italian language. For fans of MYSTICUM, BLACKLODGE and old ABORYM.